The irresistible freshness of a bouquet of roses punctuated by noted of blackcurrant leaves; a nod to Diptyque's iconic fragrance L'Ombre dans I'Eau. Its black ceramic vessel is handmade and has the brand's signature oval shape. With its three wicks, it is the perfect size to diffuse this unique accord of rose and blackcurrant leaf inside larger spaces. 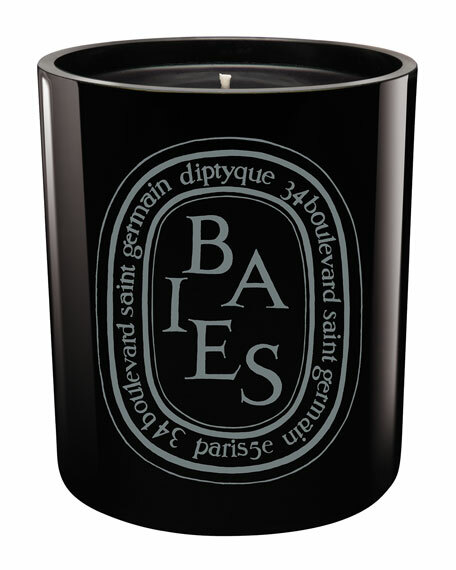 Diptyque candles are made of a high quality vegetable/paraffin wax mix, the purity and safety of which are indisputable. Furthermore for your complete peace of mind, each candle is made with a cotton, lead-free wick. The candle's wax is properly distributed so your candle burns evenly. With proper care, Diptyque candles burn for an average of 50 to 60 hours. Diptyque Baies interior scent: A bouquet of roses and black currant leaves prolong the pleasure of the Diptyque Baies collection with an elegant, lasting spray. 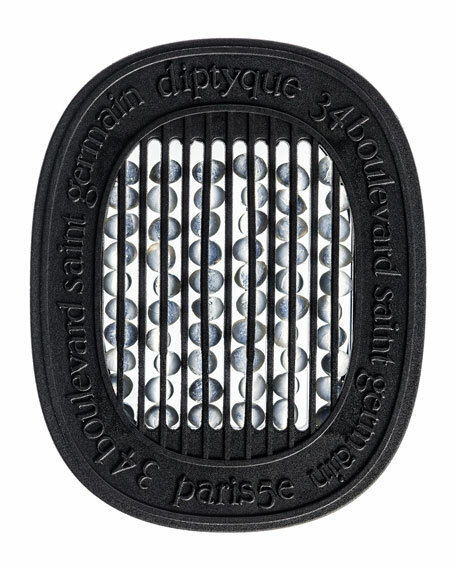 A unique product to perfume and decorate small spaces, the scented oval utilizes an innovative diffusion system using Diptyque's know-how: scented wax. Bury it in drawers. Slip it into a cupboard of clean and fresh household linen. Each oval of scented wax, engraved with the name of the scent, is encased in a white porcelain medallion in a discretely luxurious style. It has a sober and elegant black cotton cord so it can be hung up easily. 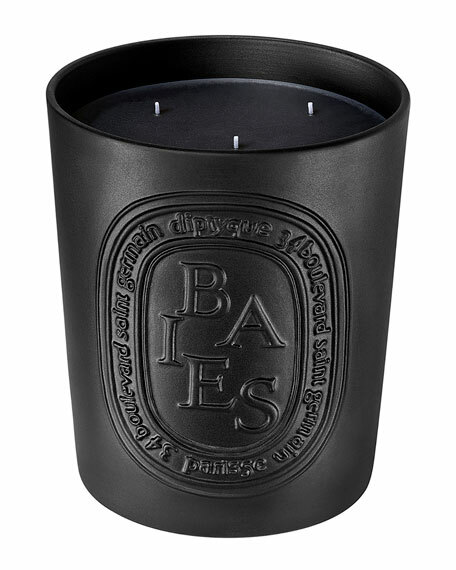 The classic Baies scent presented in a black glass container. Baies recalls a bouquet of roses and black currant leaves, a companion to Diptyque eau de toilette, L'Ombre dans l'Eau. Diptyque teamed up with Virebent, a well-known porcelain manufacturer established in 1924, to make its indoor/outdoor scented candle. Earthenware was chosen for its rustic touch and handcrafted look, and because it embodies and brings to life the brand's emblematic oval. This Diptyque candle is made exclusively by hand, and take no fewer than nine distinct operations. 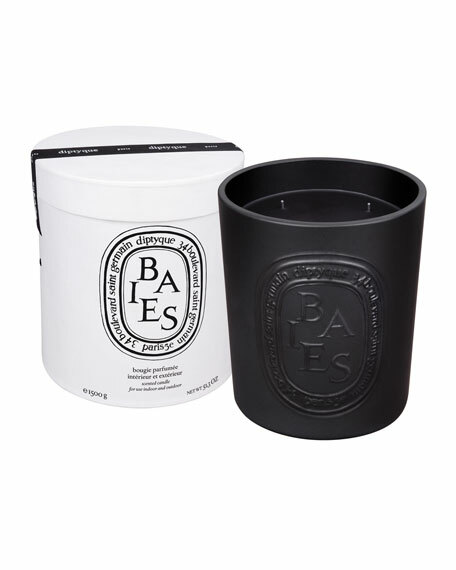 This five-wick Baies scented candle recalls a bouquet of roses and black currant leaves. Burn candles for three or four hours at a time. Candles burns for approximately 150 hours. In most scenarios, candle fragrance equivalent is to burning two standard candles at the same time. Keep candles out of the reach of children. A bouquet of roses and black currant leaves, a companion to Diptyque eau de toilette, L'Ombre dans l'Eau. This ingenious, hermetically sealed capsule, oval-shaped and printed with the Diptyque symbolic codes, contains the Baies scent. Simply slide one into the little hi-tech machine, then switch it on by pressing the top, and let it diffuse the scent 3 times during a 1-hour cycle (10 minutes active, 10 minutes rest). Repeat as often as you wish. Electric Diffuser is not included.